By the early 1970s, the Soviet Union was at the peak of its power. The Communist Party remained the sole political force in the Soviet Union, but decades of post-Stalinist economic reforms left the Soviet empire with a seemingly robust economy and an increased standard of living for Soviet citizens. Wages in the Soviet Union increased sharply. The Soviet Union was the world's leading producer of steel and oil. Urban dwellers enjoyed modern appliances, such as televisions and dishwashers, and lived mostly in the plentiful newly-constructed single-family apartments. In addition to these economic advantages at home, the Soviet Union attempted to assert itself as the world's dominant superpower. For nearly every Soviet success in the early 1970s, the United States suffered a setback. While the oil-rich Soviet economy continued to grow, the economy of the United States strained under the pressure of the OPEC imposed oil embargo of 1972 and 1973. The Soviet Union also prevailed on the international stage. Soviet-backed North Vietnamese forces expelled American troops after a prolonged conflict. The communist victory in Vietnam, coupled with U.S. public opposition to the conflict, signaled an end to the American policy of communist containment in Southeast Asia. With further containment of communism in doubt, the United States had to reposition itself on the international scene. The administration of President Richard M. Nixon embarked on a policy of détente with China, culminating with Nixon's trip to China, and, to some degree, with the Soviet Union. The pace of Soviet nuclear weapon production greatly alarmed Washington. Fearing a Soviet advantage in the arms race, Nixon signed the Strategic Arms Limitations Talks (SALT I). 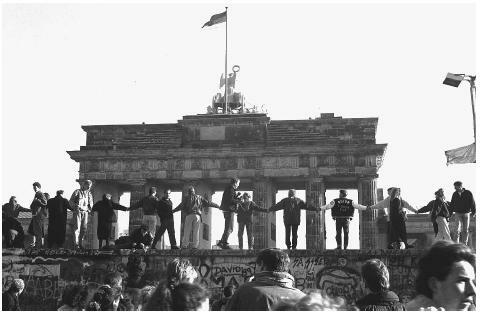 Berliners sing and dance on top of the Berlin Wall in front of the Brandenburg Gate to celebrate the opening of East-West borders in 1989. Built of barbed wire and concrete in 1961, the wall divided Berlin and became the most powerful symbol of the Cold War. wounded by opposition to the Vietnam War, however, America resorted to conducting covert operations in Latin America. During the administration of President James E. Carter, communist backed Sandinistas overthrew Nicaragua's government. President Ronald Reagan later provided financial and material support to anti-Sandinista rebels. Reagan also backed anti-communist forces in El Salvador, even though Congress did not always agree with the White House on the issue of Nicaragua and El Salvador. With proxy victories in Southeast Asia and Latin America and with a booming national economy, the power of the Soviet Union appeared formidable under Soviet Premier Leonid Brezhnev. To many outside observers, the Soviet Union appeared to be on the verge of winning the Cold War. The post-Brezhnev years, however, would see the internal collapse of the Soviet Union. Even while the Soviet Union was soaring to new heights, cracks were beginning to form in the monolithic empire. Economic troubles, military failures, and emerging nationalism would soon result in the end of the Soviet Union and communist regimes in Eastern Europe. Economic stagnation and the arms race. The vigorous Soviet economy of the late-1960s and early 1970s quickly fell victim to the very factors that had contributed to its success, central planning and raw materials allocation. Brezhnev recognized that the Soviet economy was slowing, and attempted to patch problems rather than completely overhaul the system. His efforts failed. Even if Brezhnev had attempted to overhaul the Soviet economy, the highly entrenched special interests that made their living by manipulating the Soviet Union's centrally planned economy could have defeated Brezhnev's efforts. Throughout the 1970s and into the mid-1980s, the Soviet Union's GNP and industrial output continued to increase, but at a lessening pace, eventually leading to economic stagnation. The Ninth Five Year Plan (1970–1975) saw a growth rate of approximately 3%. The period of 1975–1980 experienced a growth rate of between 1% and 1.9%, depending on whether revised Soviet numbers or the West's estimate is examined. Likewise, 1980–1985 saw a further decline in economic growth, between 0.6% and 1.8%. Declining economic growth rates were not confined to the Soviet Union. Eastern Europe, with its economies intertwined with the Soviet Union's, suffered a similar fate. This declining growth rate in the 1970s and 1980s resulted in the Soviet Union receiving a diminishing rate of return on capital investment. This proved disastrous for the Soviet economy, because by 1980, the Soviet Union was spending nearly one-third of its GNP on capital investment, with most of the sum dedicated to the military. The military was consuming such a large portion of the Soviet economy for two reasons: the Soviet involvement in Afghanistan and the arms race with the United States. These two events would weigh heavily in the Soviet economic demise and lead to its inevitable fall. A weak economy prevented the Soviet Union from reacting appropriately to each experience. The stagnant Soviet economy of the 1970s would have faired far worse had it not been for vast oil and natural gas production propping up the economy. By the late 1970s, technological backwardness and poor management under the centrally planned Soviet economy resulted in depleted oil and gas reserves. This led Brezhnev to turn his eye towards the oil and gas reserves of Central Asia. Afghanistan had long been a relatively undeveloped country comprised of numerous semi-autonomous ethnic groups. Brezhnev assumed that the Soviet Union could achieve a quick and decisive victory over the country and expand its influence of Communism into Central Asia. The United States and the rest of the world quickly condemned the Soviet invasion of Afghanistan in 1979. The United States also provided covert support to the mujahideen, or Afghani resistance fighters. Rapid turnover in Soviet leadership following the death of Brezhnev in 1982 also hampered the war effort. The short-lived regimes of Yuri Andropov and Konstantin Chernenko provided for an inconsistent Afghan policy. The Soviet military operation quickly bogged down and faced stiff resistance in the harsh terrain of Afghanistan. The Soviets erroneously assumed that since the Afghans were economically disadvantaged, they would be quickly defeated and embrace communism. The opposite result happened. As the Afghans had little to lose by continuing to fight, instead of driving Afghanistan to communism, the Soviet invasion forged the Afgani Islamic resistance. A decade after the invasion, Soviet troops withdrew. The war in Afghanistan had an even more adverse effect on the Soviet Union than the Vietnam War had on the United States. Thousands of Soviet troops died in a conflict that resulted in the defeat of a superpower by a developing country. Moreover, the conflict strained an already weak economy. The conflict angered Soviet citizens, and they began demanding accountability from the state. Brezhnev and his successors intended the war in Afghanistan to reassert the supremacy of the Soviet Union. Instead, the conflict proved that the superpower's might was waning. The war in Afghanistan also distracted the Soviet Union from its arms race with the United States, thus allowing America to gain a technological advantage. The United States ratcheted up pressure on the U.S.S.R. through several means. The Reagan administration began placing missiles in Western Europe, primarily in Western Germany, strategically located to intimidate Eastern Europe and the Soviet Union. Reagan also began building up the U.S. military. Reagan commissioned new aircraft carriers and expanded America's stealth aircraft program. To the Soviets, these actions signaled a widening weapons gap, particularly in terms of technologically advanced weapons. Perhaps the greatest threat to the Soviet Union was the United States' Strategic Defense Initiative (SDI), also known conventionally as Star Wars. The SDI was a planned satellite based weapons system that would detect and destroy missiles fired at the United States. Such a technological advancement would have rendered Soviet ICBMs useless. The Soviet Union tried to dissuade the United States from implementing the SDI, but the Reagan administration refused to back away from the proposal. In reality, the SDI was only in the technological planning stages; the Soviets, however, bought America's bluff, prompting a quick and expensive advance in their lagging military technology. This increased spending further accelerated the Soviet economic decline. Realizing a weapons gap, the Soviet Union began pushing the Reagan administration for nuclear arms talks following the death of Brezhnev in 1982. The U.S. soon entered negotiations over the Strategic Arms Reduction Treaty (START). However, numerous changes in post-Brezhnev Soviet leadership, Solidarity strikes in Poland, and other issues prevented the completion of the START during the Reagan administration. Gorbachev and the end of the Cold War. After a decade of over-inflated military expenditures, dwindling oil revenue, and a centrally-planned economy that was too rigid to adapt to consumer demands, Mikhail Gorbachev, upon assuming office, declared the Soviet economy to be in a "pre-crisis." Gorbachev immediately transformed the face of Soviet politics. Gorbachev quickly appointed new members to the Politboro and Secretariat, ridding each of many hardline, longtime bureaucrats. Gorbachev also attempted to reform the KGB, replacing many agents and bureaucrats. Despite the shake-up, the KGB's operational power emerged from Gorbachev's early reforms relatively unscathed. After reforming the government, Gorbachev set out to reform the economy and ultimately, Soviet society. Gorbachev's economic reforms ( perestroika, or restructuring), were perceived as noble, but poorly executed. The Twelfth Five Year Plan tried ambitiously and quickly to reform the Soviet economy. Gorbachev sought to update industrial equipment and computer systems, while simultaneously expecting workers to produce higher quality products in greater quantities. Gorbachev also tried to decentralize the economy by giving different regions greater control over industry. All of these goals proved to be unrealistic given Gorbachev's timetable to dismantle the gargantuan Soviet bureaucracy in favor of a more streamlined and efficient system. By 1986, Gorbachev also began experimenting with the notion that greater democracy, if presented in the proper format, would lead to increased socialism. Gorbachev wanted to strip away Stalinism and its accompanying bureaucracy and return to the communism of Lenin. Initially, Gorbachev underestimated the effect that allowing Soviet citizens to question the past, in particular the brutality of Stalin, would have upon the citizenry, leading them to follow their lines of questioning up to the present day. Soon, however, Gorbachev came to accept and embrace the concept that he termed glasnost, or "openness." Glasnost initially allowed only the divulgence of information by the state. Gorbachev held that if the Soviet Union was more open and honest about its past, then Soviet and Eastern European citizens would be more likely to follow Gorbachev's economic lead. Even a large number of bureaucrats in the KGB supported glasnost. The KGB's information network had become burdened and as ineffective as the bureaucracy that it supported. Therefore, many KGB officials assumed that fostering an atmosphere of openness would result in new and better informants. Although Gorbachev intended glasnost to strengthen the communist regime, he did not initiate a crack-down when Soviet citizens went beyond the original intent of glasnost. Soviet intellectuals began questioning the very tenets of Soviet Communism and attacked the Communist Party in newspapers, journals, film, and books. Eastern European thinkers followed the lead of their Soviet counterparts. Consequently, glasnost had the unintended effect of spurring nationalist and anti-communist movements in Eastern Europe and the Soviet republics. Dissidents in Poland, East Germany, Czechoslovakia, and other Soviet-satellite states staged labor demonstrations. Citizens took to the streets, demanding that the Communist Party step aside and allow democratic elections. In fall 1989, the Berlin Wall, long a symbol of the division between Eastern Europe and the world, fell, allowing East and West Berliners to cross freely. The Communist Party and its East Germany secret police organization, the Stasi, had lost power. Within months of the fall of the Berlin Wall, other Eastern European countries broke away from Moscow's influence and expelled their communist leaders. With the exception of Romania, most of the revolutions of 1989 and early 1990 were relatively peaceful. In the wake of the Eastern European revolts and the euphoria that followed, the Soviet Union had little choice but to allow greater freedoms. In February, 1990, the Communist Party agreed to relinquish its political monopoly. Many of the civic groups that had been voicing displeasure with the Soviet system formed political parties. Most of these new parties, especially those outside of Russia had a nationalist agenda. Within a month, the Baltic republic of Lithuania declared itself an independent state. Other Soviet republics quickly followed. In June 1991, Gorbachev allowed free elections to choose a president of the Russian Republic. Boris Yeltsin, a former Gorbachev-supporter, won a landslide victory over Gorbachev's chosen candidate. In August, 1991, a group of communists hardliners attempted a poorly organized coup while Gorbachev was on vacation at the Black Sea. The coup failed, and strengthened Boris Yeltsin, the primary target of the coup. The coup also undermined the leadership of Gorbachev, who continued to govern ineffectively until his resignation on December 25, 1991. The following day, the Supreme Soviet officially declared an end to the Soviet Union. Baucom, Donald. The Origins of SDI. Lawrence, KS: University Press of Kansas, 1992. Brown, Archie. The Gorbachev Factor. Oxford: Oxford University Press, 1997. Colton, Timothy, and Robert Legvold. After the Soviet Union. New York: W. W. Norton, 1992. McGuire, Michael. Perestroika and Soviet National Security. Washington, D.C.: Brookings Institute, 1991. McMahon, Robert. The Cold War on the Periphery. New York: Columbia University Press, 1994.